If a woman suffers from accidental or involuntary loss of control of her bladder, it is called urinary incontinence. Pregnancy, childbirth, menopause, and the structure of the female urinary tract contribute to urinary incontinence. Incontinence is not inevitable with age. Incontinence is treatable and often curable at all ages. Incontinence is categorized according to the circumstances under which urine is lost. Stress incontinence is the loss of urine during contractions of the abdomen caused by sneezing, laughing, coughing, exercising, and other such actions. 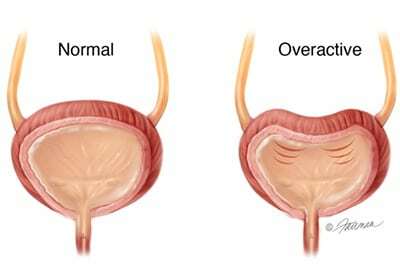 Overactive Bladder (OAB) is a condition in which the urge to urinate is sudden and extreme, and urine is often expelled before a bathroom is reached. This occurs even when there is a minimal amount of urine in the bladder. Often, women will experience both stress and urge incontinence. Identifying the origin of urinary incontinence can be a challenge. Diagnosis begins with a detailed medical history. Your provider at Urology Care P.C. will assess the pattern and nature of the leakage in order to help determine the type of incontinence you are experiencing. A physical examination that includes a pelvic exam is an important part of your evaluation. Your provider may perform a bladder scan in the office to visualize the bladder contents. Bladder scanning is a non-invasive, painless test. Your provider at Urology Care P.C. can assess your emptying ability with this test, similar to an ultrasound. Your provider will need a urine sample to analyze for evidence of infection or blood in the urine. In some cases, a urodynamic study, a more detailed bladder function test done in the office, will be necessary to gain a clearer understanding of your urinary issues. If necessary, a voiding diary is a simple and informative way to help diagnose urination patterns and incontinence. Acute urinary incontinence associated with infections, kidney stones, or the side effects of medication often resolves when the primary problem is successfully identified and treated. Incontinence can originate from a variety of circumstances. The treatment plan will be tailored to the specifics of your incontinence and your needs as an individual. This is one of the newest non-surgical treatments for female incontinence. Learn more by visiting our web page on Votiva. Percutaneous Tibial Nerve Stimulation (PTNS) is a non-invasive treatment for overactive bladder (OAB) and urge incontinence. By indirectly providing electrical stimulation to the nerves responsible for bladder and pelvic floor function, the treatment can change and improve bladder activity. For patients experiencing the symptoms of overactive bladder (OAB) such as urgency, frequency, and incontinence, PTNS is an effective treatment. It is generally recommended after behavioral and dietary modifications, Kegel exercises, or medications have been ineffective. As this improvement happens gradually, you will receive a series of treatments, typically twelve thirty-minute treatments administered on a weekly basis. After the treatment series, your response to the therapy will be assessed, and if indicated, monthly maintenance treatments may be recommended to ensure the ongoing success of PTNS. Botox is a neuromodulator medication that is used to treat overactive bladder (OAB) and urge incontinence. How is the treatment administered? Your doctor will use a small telescope called a cystoscope to look inside the bladder and inject about 100 – 200 units of Botox into the bladder wall. This is a simple and well-tolerated office procedure. On average, you can typically see results in a week or two. Our goal is to see improvement in urinary symptoms such as longer intervals of holding urine, less nighttime urination, and less incontinence. Results usually last for 6 to 12 months. The procedure may be repeated when the symptoms return. For some women, symptoms of stress incontinence don’t respond to conservative treatment. When you have tried conservative measures and urinary incontinence continues to disrupt your life, your provider at Urology Care P.C. may suggest surgery. 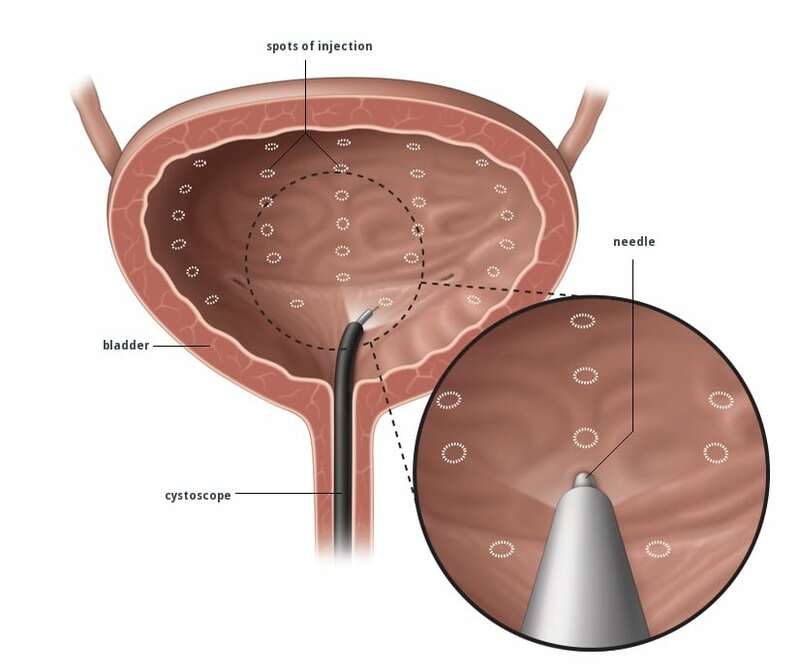 A urethral sling procedure corrects stress incontinence by placing a small strip of material under the urethra. The sling provides backboard support for the urethra during straining maneuvers and other stressful activities. Hence preventing leakage from occurring. The sling is similar to a hammock under the urethra. You and your provider will decide whether or not you are an appropriate candidate for a sling. Medtronic Bladder Control Therapy, also known as InterStim Therapy for Urinary Control, is used for the treatment of urinary retention and the symptoms of overactive bladder including urinary urge incontinence and significant urgency and frequency. Generally, it is used for patients who have not responded to more conservative treatment options. By implanting a neurostimulator in your lower back, Medtronic Bladder Control Therapy can help forge the connection between the muscles that are responsible for urinary function and your brain to improve your symptoms. Bulking substances may be injected to provide support and bulk to the urethral wall. These substances compress the urethra to reduce certain types of stress incontinence. There are a number of medications that can reduce leakage. Some of these inhibit an overactive bladder and urge incontinence by stabilizing muscle contractions. Hormone replacement therapies, usually involving estrogen, may also help restore more normal bladder function. Life’s events can weaken the pelvic floor muscles—pregnancy, childbirth, and being overweight can be contributing factors. Luckily, when these muscles get weak, you can help make them strong again. Pelvic floor muscles are just like any other muscles. Exercise can make them stronger. Women can regain bladder control through pelvic floor muscle exercises, also known as Kegel exercises. Your provider at Urology Care P. C. will inform you about and teach you how to do these exercises. Some women have difficulties doing these exercises correctly. If that is the case for you, you may be a good candidate for Votiva or physical therapy. When incontinence disrupts your quality of life, our team at Urology Care P.C. is here to provide you with high-quality personalized care to ensure your long-term success. Our expert providers will evaluate you and create a personalized comprehensive treatment plan. To determine what treatment is best for you, contact us at 520.298.7200.